The December 2014 issue of the Journal of the Academy of Nutrition and Dietetics included this supplement, supported by funding from Academy partner the Kellogg company. This research supplement provides four continuing education units (CEUs) for dietitians. Remember, dietitians need to complete 75 of these units every five years to maintain their credential. 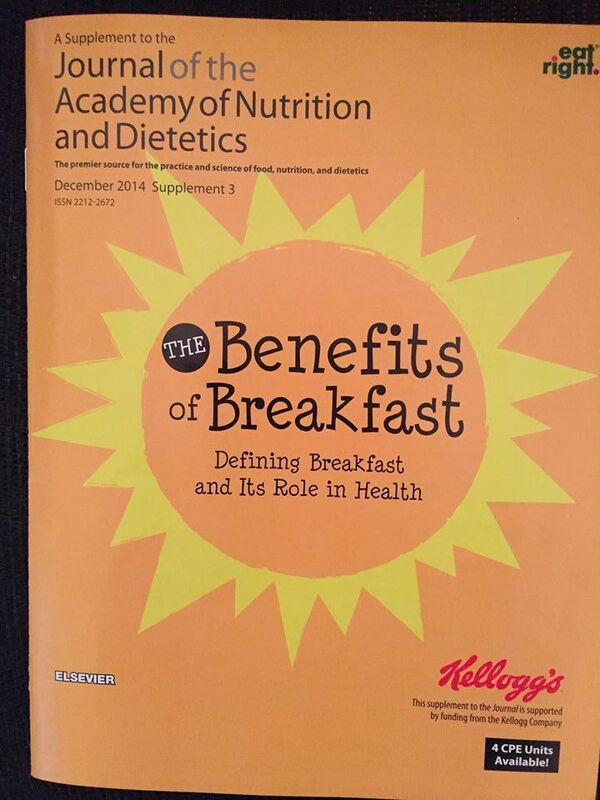 Not surprisingly, the research articles in this journal paint breakfast cereals in a very positive light. Fair enough, but many breakfast cereals offer quite a bit of added sugar (and, in some cases, unhealthy oils — Froot Loops is made with hydrogenated oils), which is certainly troubling from a heart disease standpoint. A standard industry talking point (the Sugar Association, for instance, states sugar helps make vegetables more palatable to children). Considering that the average American is eating 20 teaspoons of added sugar a day, why promote sweetened grains? Ah, the ever-elusive moderation. One thing is for sure: in the United States, sugar is not consumed in moderation. Also, body weight should not be the only marker for health. Ready-to-eat cereals are fortified (in that case, they are essentially a multivitamin), but fortified foods are not nutritionally equal to whole foods that offer vitamins and minerals as well as phytonutrients. Also note how there is no mention of added sugar intake for those who consume ready-to-eat cereals. This is akin to saying — which industry does say, by the way — that caramel dip can be a “vehicle” for encouraging consumption of apples. Is eating a piece of fruit that difficult unless it is accompanied by a bowl of Frosted Flakes? Considering that ready-to-eat cereal sales are in free-fall (fellow Academy partner General Mills is really in a slump), this supplement comes at a very opportune time for Kellogg’s.